The tofu recipe of our dreams. Sweet, spicy, and not at all greasy, with a hint of bright citrus. I think we are in love…. I could continue to wax poetic about the balance of the ingredients, the texture of the broiled tofu, but let’s just get right to the recipe, shall we? Whisk together soy sauce, maple syrup, Sriracha, and lime juice. 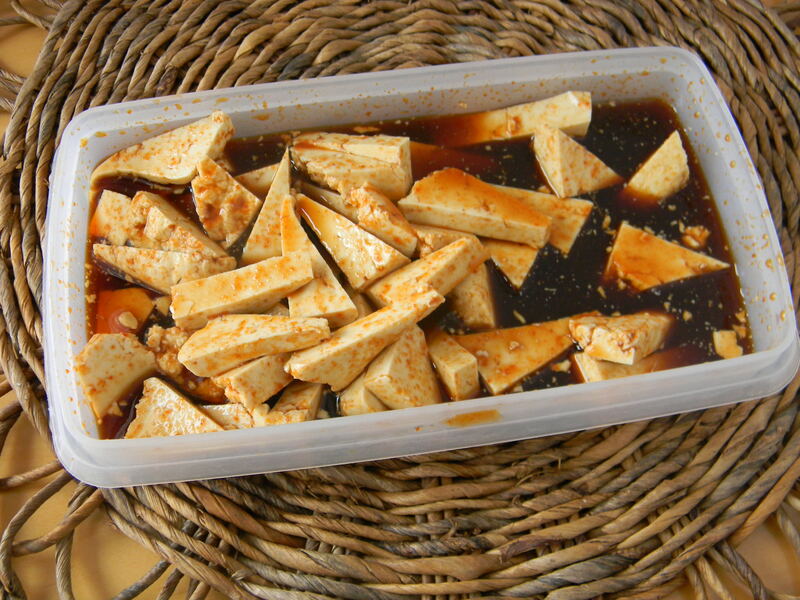 Place tofu in a sealable container. 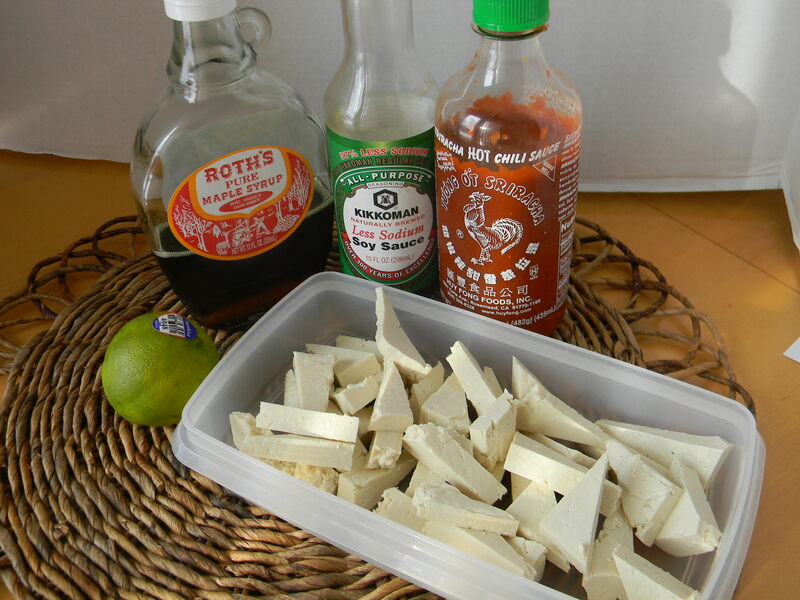 Pour sauce over tofu. Cover and shake gently to distribute sauce. As you can see, I didn’t shake very gently. Oops. Let marinate for 6-8 hours. Turn on broiler. Place tofu on a lightly oiled pan or a silicone mat on a baking pan. Remove from oven and drizzle leftover marinade over tofu. Broil for 3 more minutes. Remove from oven and repeat (drizzle leftover marinade over tofu). Broil for 3 more minutes. 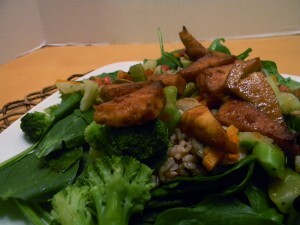 Serve with steamed veggies, brown rice, leftover marinade all on top of a nice bed of spinach. Can’t get much healthier than that! Recipe Review: My only regret? Not taking more pictures throughout the process. I read about this non-flip method of broiling tofu in Veganomicon (my new favorite cookbook). It’s brilliant. Particularly brilliant for lazy people like me. I don’t want to be bothered with flipping all these little pieces of tofu. I don’t mind drizzling sauce over it, but flipping. Bah! The result of the drizzle and broil technique? 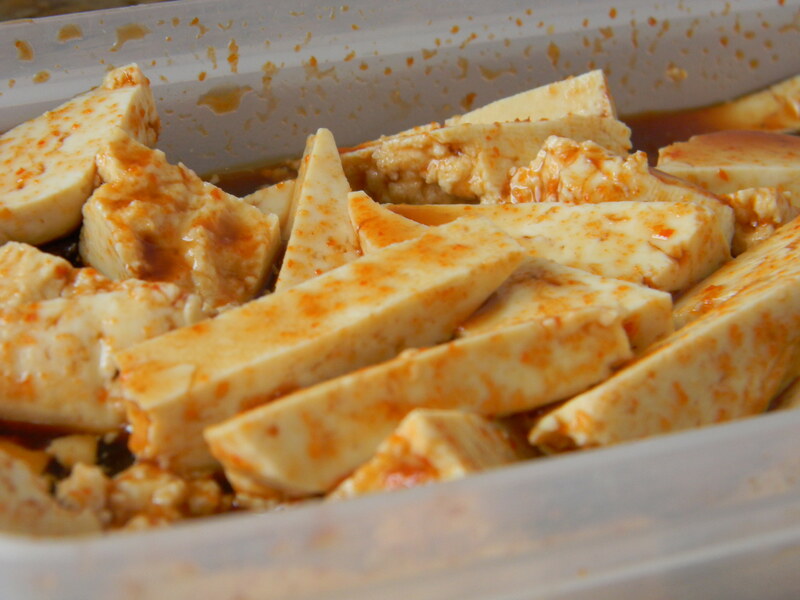 The tofu is caramelized with the sweet, tangy, spicy marinade. This is the tofu that you serve your meat-loving friends. This is the tofu that converts people. What you don’t have any Sriracha? Enter to win 2 bottles of Sriracha in this week’s giveaway. This is the tofu that is now part of Citrus Love. January is citrus month so below you will find posts from food bloggers all over the world sharing their favorite citrus recipes. 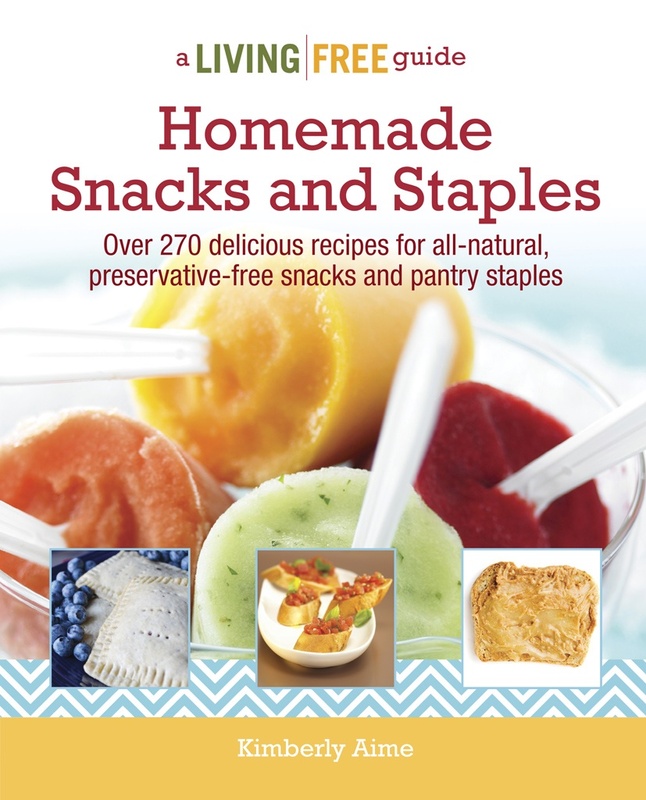 If you have a citrus recipe, don’t be shy! Add it below! 286 Comments on "Even More Citrus Love: Sweet and Spicy Tofu"
Sounds and looks absolutely delicious, and oh-so-healthy. Just printed the recipe, thank you. Thank you! I know, I am also always looking. This one won’t disappoint! Oh this is a good one. 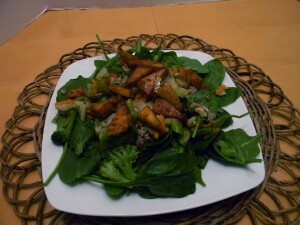 I love new tofu recipes. Still wroking on that tofu press for a post. hehe. 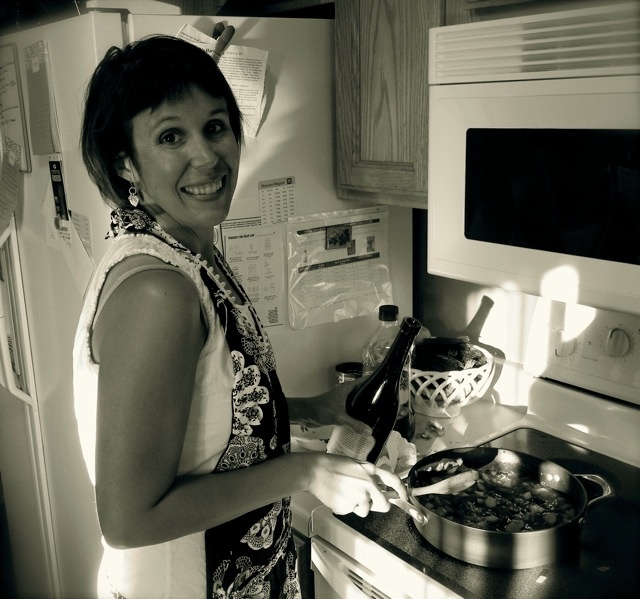 I just want to mention I’m all new to weblog and certainly enjoyed this blog site. Most likely I’m going to bookmark your website . You actually have wonderful posts. Bless you for sharing your blog. to be a leisure account it. Glance complex to far brought agreeable from you! Hello to every single one, it’s really a pleasant for me to pay a visit this web site, it consists of useful Information. You completed certain nice points there. I did a search on the topic and found the majority of persons will have the same opinion with your blog. Normally I don’t learn article on blogs, but I wish to say that this write-up very compelled me to try and do so! Your writing style has been amazed me. Thank you, very great article. You can certainly see your expertise in the paintings you write. The world hopes for more passionate writers like you who are not afraid to say how they believe. All the time follow your heart. I enjoy you because of all of the effort on this web page. Kate delights in doing internet research and it is obvious why. Most of us know all of the lively medium you provide very important tips and hints via the web blog and cause response from others on the theme and my girl has always been learning a great deal. Enjoy the rest of the new year. You are conducting a great job. ffubsytzbg Yeezy Shoes,If you want a hassle free movies downloading then you must need an app like showbox which may provide best ever user friendly interface. Fastidious answer back in return of this difficulty with real arguments and explaining all regarding that. or did you modify it yourself? Anyway keep up the nice quality writing, it’s rare to see a great blog like this one these days. What’s up Dear, are you genuinely visiting this site regularly, if so then you will without doubt get nice knowledge. Hi, Neat post. There is an issue along with your website in internet explorer, would test this¡K IE still is the marketplace leader and a huge element of other folks will pass over your excellent writing due to this problem. owuuprsugj,If you are going for best contents like I do, just go to see this web page daily because it offers quality contents, thanks! ugkwuo,Thanks a lot for providing us with this recipe of Cranberry Brisket. I’ve been wanting to make this for a long time but I couldn’t find the right recipe. Thanks to your help here, I can now make this dish easily. I would like to voice my appreciation for your kind-heartedness in support of folks that must have help on your niche. Your personal dedication to passing the solution all-around had become particularly informative and have specifically helped associates just like me to reach their objectives. Your personal warm and helpful help implies this much to me and a whole lot more to my colleagues. Regards; from all of us. IE nonetheless is the marketplace leader and a large element of people will miss your great writing due to this problem. penny? I’m not very internet savvy so I’m not 100% sure. Any tips or advice would be greatly appreciated. till now. But, what concerning the conclusion? Are you sure in regards to the supply? Hello there, I found your web site by the use of Google even as searching for a related matter, your web site came up, it appears to be like great. I’ve bookmarked it in my google bookmarks. I want to express thanks to this writer for bailing me out of this type of situation. Because of searching through the online world and coming across opinions that were not helpful, I thought my life was gone. Being alive devoid of the solutions to the difficulties you have solved as a result of your good guideline is a crucial case, and those that could have adversely damaged my entire career if I hadn’t encountered your web blog. Your primary capability and kindness in maneuvering everything was vital. I don’t know what I would’ve done if I hadn’t come upon such a thing like this. I can also at this moment relish my future. Thanks a lot so much for the professional and effective help. I will not think twice to endorse the sites to anybody who should receive counselling about this area. hcsvqyumh,Definitely believe that which you said. Your favourite justification appeared to be on the net the simplest thing to remember of. srmdnv,Very helpful and best artical information Thanks For sharing. I will be told lots of new stuff right here! Good luck for the next! It is truly a great and useful piece of info. I am glad that you simply shared this helpful information with us. Please stay us up to date like this. Thank you for sharing. Fine way of describing, and pleasant article to obtain data about my presentation subject matter, which i am going to present in school. vanilla. You might look at Yahoo’s front page and see how they write post titles to grab viewers interested. You might add a related video or a pic or two to get people interested about what you’ve written. matter, your site got here up, it appears good. views of all friends on the topic of this post, while I am also zealous of getting experience. however this post provides good understanding yet. community. Your web site offered us with valuable information to work on. You have done a formidable job and our whole community will be thankful to you. are stating and the way wherein you say it. Love: Sweet and Spicy Tofu <Loved it! A person essentially lend a hand to make seriously posts I might state. This is the very first time I frequented your website page and to this point? I surprised with the research you made to make this particular publish incredible. Fantastic task! website which offers these stuff in quality? I am slightly certain I’ll be told plenty of new stuff proper right here! PcMMM7 Pretty! This has been an extremely wonderful post. Thank you for providing this info. Thank you for every other informative web site. Where else could I am getting that kind of info written in such a perfect way?
) I take care of such information a lot. I was seeking this certain information for a long time. weblog posts. After all I’ll be subscribing to your rss feed and I hope you write again soon!